A celebration of the 3D stereo viewer that brought us Bible Stories, Birth of Jesus, Noah's Ark, and more. 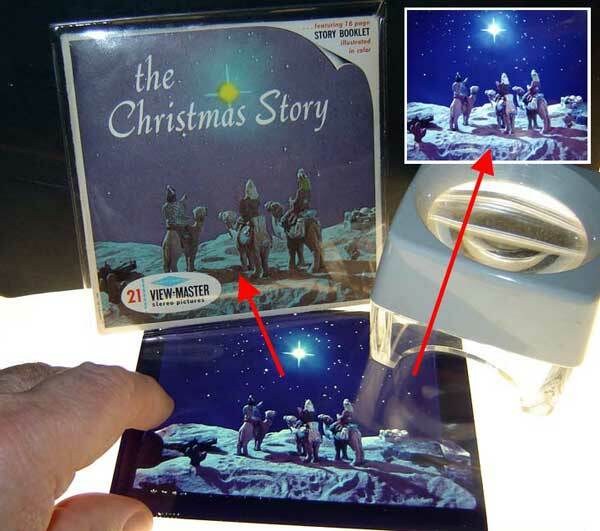 ARTICLE: A celebration of the 3D stereo viewer that brought us Bible Stories, Birth of Jesus, Noah's Ark, and more. (above photo): Stories from the Christian Bible... A few sample images from the many different Christian-based View-Master reels. 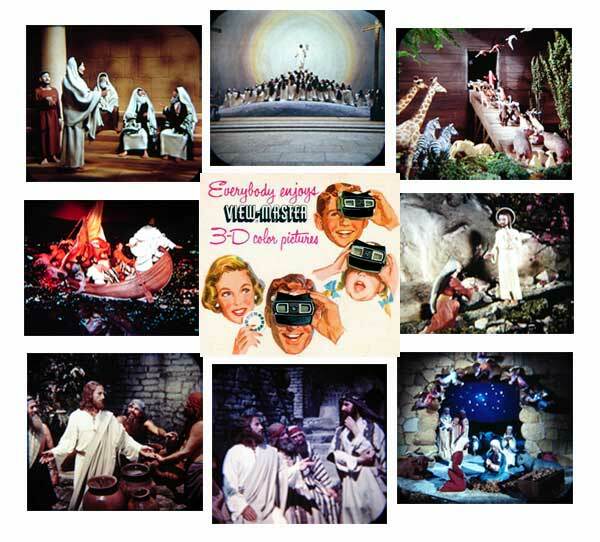 View-Master brought Bible history alive in 3-dimensional stereo Kodachrome high-fidelity images. View-Master was the fun 3D viewer that brought all your favorite Biblical stories into your homes, schools and churches. And in 2019, it is celebrating its 80th birthday. Hello, I'm Frank DeFreitas, and welcome to Wonders of the Bible. The view-master stereoscope system was invented by William Gruber from Portland, Oregon, USA and introduced to the public at the 1939-1940 New York World's Fair. Through View-Master, people would be able to travel around the world in 3D, visiting places like Europe, Africa, North and South America, Australia, the Philippine Islands, India, and the Holy Land. Remember, television was just getting started around this time. The year 1939 saw two history-making television experiences: the first broadcast of a baseball game: a double-header between the Cincinnati Reds and the Brooklyn Dodgers; and also the first television broadcast of an NFL football match up between The Brooklyn Dodgers and the Philadelphia Eagles. (above photo): View-Master Wasn't Alone... 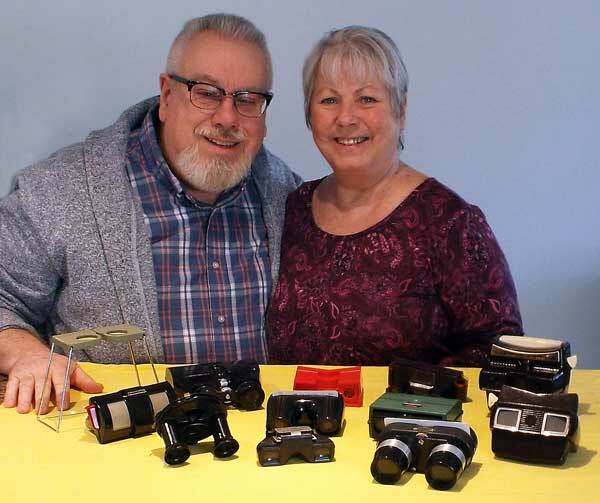 Here I am with my wife Debi, and a sample collection of various mid- 20th century, hand-held stereoscopes: View-Master; Stereo Realist; Three Dimensional Company; Stori-Viewer; Tri-Delta Prism Stereo Viewer; Radex Company; Tru-Vue Company; Zeiss folding military field stereoscope. View-Master used round reels which held small 16mm pieces of film. On every reel, there are 14 transparencies in 7 pairs of stereo views: one image for the left eye, one image for the right eye. When viewed through one of the many view-master viewers, the images are perceived as 3D. 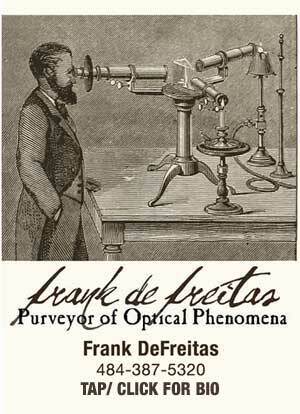 This was much different that the 3D stereo view cards of the 1800's and early 1900's. I guess one could say that the previous technology, stereographs, were mostly -- but not always -- reflection media (with light being reflected OFF the card to the viewers eyes) … while the View-Master stereo film reels were transmission media (with light being transmitted THROUGH the film to the viewers eyes). It should also be noted that View-Master wasn't the first of such viewers … that designation was held by a 3D stereoscope called the Tru-Vue. Tru-Vue was introduced to the public during the height of the great depression in 1931, and we'll give these viewers and memorabilia their own show in the future. They also have some really great 3D stereoscopic Bible stories. At the time of its introduction, the View-Master stereoscopic viewer sold for $1.50, and individual reels sold for 35 cents each. View-Master provided them in color, by using Kodak's new color transparency film, Kodachrome. Even in 2019, 80 years later, Kodachrome film still maintains its beautiful color. (above photo): An Original Production Kodachrome... An original View-Master production studio Kodachrome. It would become the cover of one of their most popular Biblical packages: The Christmas Story. Wonders of the Bible Collection. Christian 3D view-master content was plentiful in the 1940's, 50's and 60's … and it was always prominently promoted right alongside all of their popular world travel reels. You could walk into many department stores and purchase your favorite Bible story in 3D for view-master. Many times a Bible story would be represented by live actors, set in authentic geographical locations. Other times, a Bible story would be made up entirely of sculpted dioramas, and shot in View-Masters studios. Many times photographed initially onto 4 x 5 Kodachrome film transparencies. But film and images weren't the only production items that were produced back in the day. Each film reel would have associated text placed in the view-master text window, so that people could read about what they were looking at. Due to this, scripts had to be written -- many times in several languages. There was also studio art work and typography involved in the production of the retail packaging, booklets, and associated advertising. "Long before the time of Christ, a young widow named Ruth, followed her also-widowed mother-in-law from the land of Moab to Bethlehem. Speaking those often quoted words of faithful love "Whither thou goest, I will go…". There, in Bethlehem, Ruth gleaned in the fields of Boaz, who later married her. Their grandson had eight sons, the youngest of which was David. This was the David who left his sheep to slay Goliath. And to become the first king of all Israel." 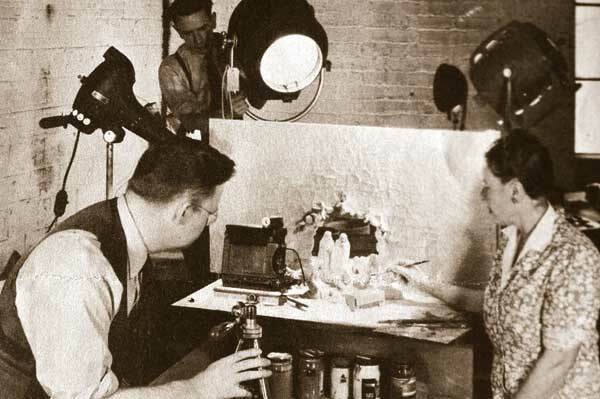 (above photo): In the View-Master Studios... View-Master production employees Tom Dixon and Florence Thomas prepare to photograph a scene from The Christmas Story in 1951. Photo from a View-Master in-house employee newsletter. Wonders of the Bible collection. That's where my Wonders of the Bible collection comes in. You see, View-Master is a very famous and popular collectible. Yet, not many people were interested in collecting the Biblical titles -- and least in comparison to those interested in the associated world travel, television shows, entertainment, cartoons. Very similar to the world today! You see, since that time, (80 years to be exact in 2019), thousands of individual titles and more than 1.5 billion View-Master reels have been issued, along with hundreds of millions of viewers, in 25 models. View-Master was a natural choice for Wonders of the Bible since its mission and purpose is to "proclaim Jesus Christ through visual arts, science and communication technologies. Several times, I was very fortunate -- and blessed -- to be in the right place at the right time. This allowed me to obtain many one-of-a-kind pieces for my collection. There are no others like them in the entire world. And I just LOVE to share their fascinating stories with friends like you. View-Master continues to move into the future. You can now find View-Master virtual reality head sets. Take a look around the web page associated with this audio lecture. It will provide you with additional information and photographs to enjoy. You can find the web page by going to wondersofthebible.org / articles. That address once again is wondersofthebible.org / articles. Scroll down the page and look for the graphic and link for the April 2019 lecture. In future installations, I will be featuring additional 3D technologies from the Wonders of the Bible collection: from 19th century stereographs to 21st century laser holograms. 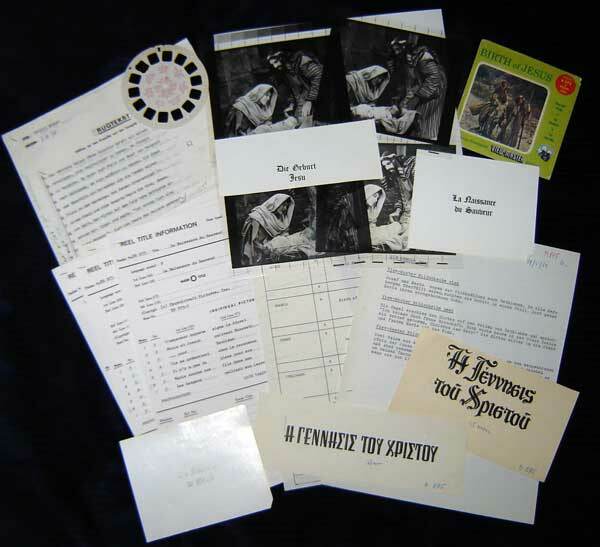 (above photo): All in a Days Work... An entire View-Master production package for "The Birth of Jesus" containing original photography, scripts in multiple languages, studio artwork, typography in multiple languages, CMYK color-separation film, production schedules, and more. Wonders of the Bible collection. "In the beginning, God created he heavens and the earth. The earth at first was without form, and it was empty of land or life. Darkness brooded over the deep abyss. But the Spirit of God, the Creator, swept over the face of the waters like a wind. Then God spoke. LET THERE BE LIGHT! He said. And there was light. God saw that the light was good; and He separated the light from the darkness. He called the light "day" and the darkness "night". So evening came, and morning came, ending the first day of creation." May God Bless You -- Today and Every Day -- AND -- remember to always love others, just as Jesus Christ loves YOU. "Science is the study of the physical manifestations of God in action." Celebrating these immensely important historical 3D stereoscopic images documenting our Christian heritage. Utilizing non-destructive laser holograms, the Shroud of Turin can now be visually examined in 3D by anyone, anywhere in the world.